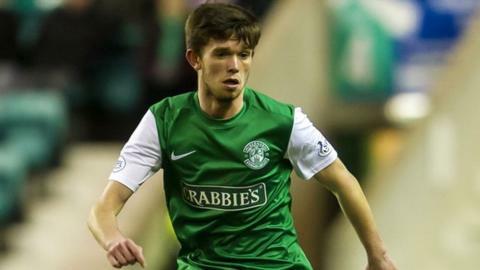 Midfielder Sam Stanton has signed a new four-year contract extension with Hibernian. The 19-year-old has become a first team regular since the arrival of manager Terry Butcher this season. "It was a really easy decision for me to make," Stanton told the Edinburgh club's website. "There is a lot to look forward to and I'm pleased to be on board for the next four years; to get that recognition from the club was a great feeling." Stanton has been at Easter Road since the age of 12 and made his debut as a substitute in January 2012. But he had to wait until this January for his first start for the club and he has scored twice since then. Butcher described Stanton as "a player with an incredibly bright future" and the teenager's breakthrough has been a rare bright spot in a disappointing campaign. "When I first arrived here Sam wasn't part of the first team squad, but now he is probably one of the first names on the team sheet - that underlines the progress he has made in a short space of time," said the manager. "He is eager to learn and continue to develop into becoming a better player and that augurs well for Hibernian in the future." Going into Saturday's visit to St Mirren, Hibs have kept a clean sheet only once in 2014 and are four points ahead of 11th-placed Partick Thistle. Striker Paul Heffernan will miss the five remaining league fixtures with a groin injury but midfielder Scott Robertson and defender James McPake are back in training after long lay-offs and may play some part in the battle to avoid the play-off spot, although neither player will be involved at the weekend. "Right now, we've got to make sure we finish this season positively," added Stanton. "We've got five games left and if we stick to our task then the wins will come and hopefully that's exactly what will happen."